Nest is no longer the only game in town when it comes to stylish smart home thermostats. Honeywell has just unveiled a connected unit of its own design that handles your home's heating and cooling so you don't have to. 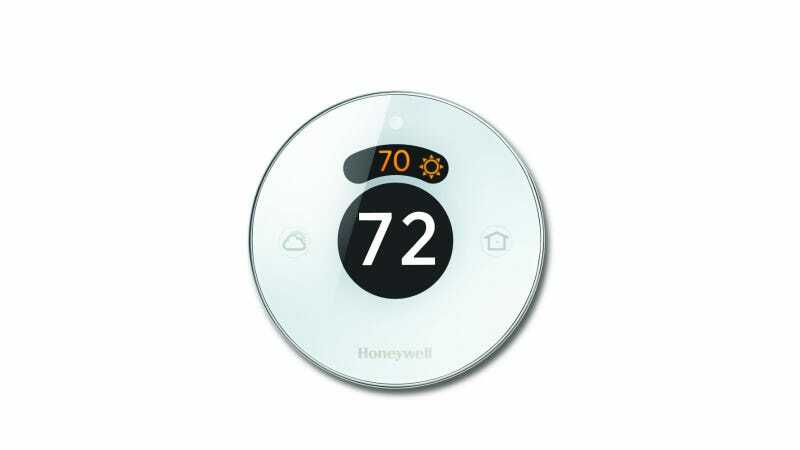 The new Lyric Smart Home Thermostat is the first in a series of smart home devices, according to Honeywell. It incorporates a slew of ingenious automation features to minimize the amount of time you have to spend fiddling with the A/C, features like variable-range geofencing, for example. By installing the associated app on your smart phone or tablet (either iOS or Android), the system can track your location and heat up your house before you get home from work or turn down the heat when you leave in the morning. The system can also be controlled by multiple apps, allowing the system to know both when everybody or specific family members have left the home. This is a slick feature, especially for the absent-minded homeowner—just don't forget your phone. The system also allows the user to set more conventional heating schedules and specific events (like "sleep" and "party") through the app as well. In fact, most all of the thermostat's features are controllable that way. "We've designed this from a consumer standpoint. Today's homeowners and their families are busy, they don't want to have to think about their thermostat but they do want to save money," Honeywell's Global PR manager Tammy Benker Swanson told Gizmodo. "So as we developed Lyric...we wanted to create an experience that matched consumer's busy lifestyles. It's comfort when you're home, savings when you're away." The Lyric also monitors the indoor temperature and humidity of your home to adjust the A/C system's performance so that 68 actually feels like 68 whether you're in Tempe or Tampa. And since this thermostat is Internet-connected, it can pull the day's 12-hour weather forecast for your specific location and display it at the touch of a button. The system also keeps tabs on the state of your A/C system's filters, pushing notifications to your phone when it is time to replace them. Gizmodo got a hands-on preview of the new Lyric thermostat last week and were quite impressed with it. Installation appears to be generally foolproof with an intensive, online step-by-step guide that is customizable to your specific wiring setup. The unit's faceplate is quite attractive and unassuming as well—overtly streamlined with only two buttons, an LED readout, and a super-smooth mechanical temperature adjustment ring running along the outer edge. This ring also casts a narrow band of orange (for heating) or blue (for cooling) light onto the wall behind it when you adjust the temperature. Obviously, this doesn't have any real utility but is a nice bit of eye candy for a device that otherwise doesn't really require you to look at directly. We'll be reviewing the $280 device once test units become available, but based on just our initial impressions, the Nest looks to finally have some serious competition.